Hulk Hogan Takes Over Crazy Taxi City Rush, Brother! SAN FRANCISCO, LONDON – Oct. 2, 2014 – Fasten your seat belts; Hulkamania® is taking over Bay City! SEGA Networks Inc. today announced that internationally renowned entertainer Hulk Hogan is taking over Crazy Taxi™ City Rush. The month-long Hulkamania Takeover event features the bombastic voice, likeness, and signature attitude of the 12-time World Wrestling Champion in a variety of costumes from his illustrious career, and will include bonus gameplay and themed content to unlock. The Hulkamania Takeover is a free update for Crazy Taxi City Rush and is now available on iPhone®, iPad®, iPod touch® and Android™ devices. The taxi riders of Bay City have become Hulkamaniacs, giving every player the chance to hire Hulk Hogan as a driver and earn bonus fare for every crash, smash, and pickup. As players use Hulk Hogan, they will fill up the Hulkameter to unlock unique Hulk Hogan-themed customizations for their taxis that add a ride bonus, and bragging rights. Players must reach level four before Hulk Hogan can be hired as a driver. But once unlocked, he will be available for hire in any mission, lending his own voice to in-game dialogue. Starting today, players will be able to compete in the Crazy Taxi Hulkamania Takeover sweepstakes. Utilizing Kamcord, a leading gameplay recording and sharing technology, players will be able to take their craziest Hulk Hogan-driven rides and share them to Twitter using the hashtag #CrazyTaxiHulk. Random winners will be chosen each week, culminating in the grand prize: a signed Hulk Hogan Crazy Taxi City Rush taxi. For more information on prizes and the sweepstakes, including rules and regulations, please go here. 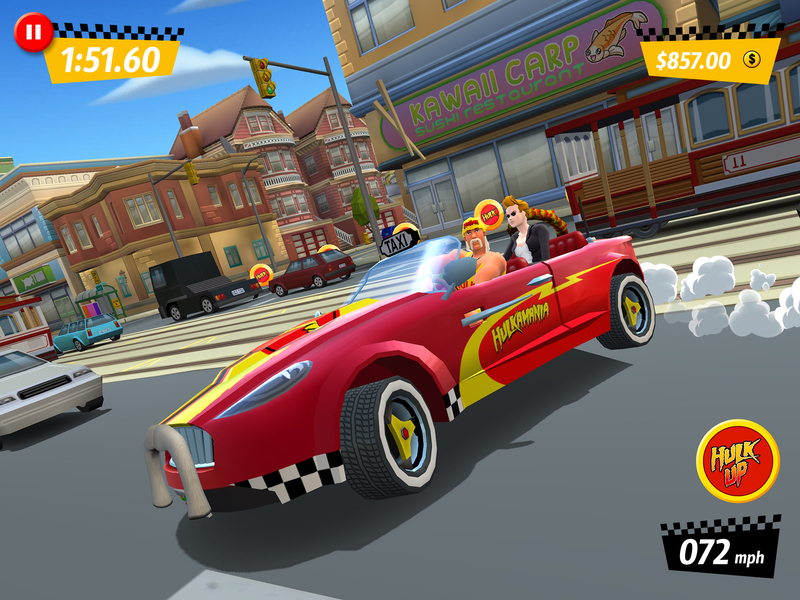 In addition to the Hulkamania Takeover event, Crazy Taxi City Rush also adds new features including full controller support, the ability to share in-game stills of your pimped-up taxi, and video-sharing abilities using Kamcord. All of these additions are now available for the game and will continue past the Hulkamania Takeover event. For more information on Crazy Taxi City Rush, please visit the official Facebook and Twitter pages. SEGA Networks Inc. is a division of Tokyo, Japan-based SEGA Corporation, and is focused on creating fun, compelling and engaging entertainment that features iconic SEGA® intellectual property as well as original content for mobile and tablet devices. Since 2008, SEGA has been a leader in the smartphone and tablet space with the wildly successful Super Monkey Ball™ and continues to be at the forefront of gaming, launching more than 85 games. SEGA Networks Inc. includes acclaimed studios Hardlight™ Studio and Three Rings™. Recent SEGA Networks Inc. titles include Sonic Dash™, Sonic Jump, Crazy Taxi City Rush and Super Monkey Ball Bounce. For more information, visit www.sega.com. Based in the UK and founded in 2012, Hardlight Studio is an internal development studio owned by SEGA Corporation. Composed of a small, dedicated team with drive, passion and creativity, Hardlight focuses on making high-quality games for mobile devices. Hardlight is behind Sonic the Hedgehog™’s latest critically acclaimed adventures on mobile platforms: Sonic Jump™ and Sonic Dash. For more information please visit: www.hardlightstudio.com. ©SEGA. All rights reserved. SEGA is registered in the US Patent and Trademark Office. SEGA and the SEGA logo are either registered trademarks or trademarks of SEGA Corporation. Android and Google Play are trademarks of Google Inc. App Store is a service mark of Apple Inc. Hulkamania is a registered trademark of Hogan Holdings, LLC. TriplePoint PR for SEGA Networks Inc.